The Slits formed in 1976 when 14-year-old Ari Up (aka Arianna Forster) ran into her friend Palmolive at a Patti Smith gig in London. Palmolive suggested that Ari become the lead singer of a new all-girl punk band. She agreed on the spot, and the Slits, with borrowed equipment and knowledge of two, maybe three chords, were a reality. They made some crude recordings that were never widely circulated, and it wasn't until they nabbed the opening spot on the Clash's White Riot tour of England in 1977 that they became a part of the punk pantheon. Despite this sudden notoriety, little was recorded by them in the early days, save for a couple of sessions of John Peel's BBC radio show. These recordings place the Slits firmly in the punk rock aesthetic of blaring guitars and braying vocals. But it's not generic-sounding rant: Ari's voice bounces along, alternately hiccuping and bellowing to the stiff rhythms; the songs are meditations on alienation, but have a satiric, tongue-in-cheek quality instead of strident preachiness. It wasn't until 1979 that the group made their first proper record under the watchful, supportive eyes and ears of reggae vet Dennis Bovell. But the Slits, due primarily to their interest in incorporating other forms of ethnic music into their mix, were leaping beyond what was commonly accepted as punk rock, and as a result, were no longer seen as a punk band. This probably didn't distress them in the least, as they were more interested in expanding the barriers of punk rock rather than simply adhering to "rules" that claimed all punk bands must bash out simplistic guitar rant. 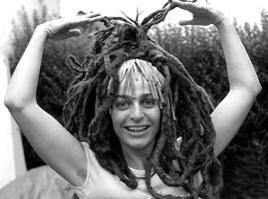 By 1980 the Slits as a group were beginning to splinter and Ari had found herself as flatmate of the young producer, Adrian Sherwood, in the midst of gathering together cohorts for his On-U Sound record label and live shows. For Sherwood, having worked with the Slits in their Clash-supporting days, it was a logical progression along the experimentation axis for her to become one of the primary driving forces in the massed ranks of the New Age Steppers, alongside members of other luminaries of the era Rip, Rig & Panic, The Flying Lizards, Public Image Limited, The Raincoats, The Pop Group and Aswad, and so help launch the first wave of On-U releases. Ari's characteristic vocalistic wails and warbles weren't pitch perfect, but in the spirit of the era, that frankly wasn't the point. In retrospect it adds a certain rough and ready charm to the proceedings - so much a part of the early On-U ethos design. By the mid 80s Ari was well on the way to launching herself as a solo artist and consequently the New Age Steppers' 1983 album "Foundation Steppers" (ON-U LP21) was to be her last regular On-U appearance. Living in Jamaica, she continued to record and gig - most regularly in the USA - and in 2007 teamed back up with Sherwood to record the first new New Age Steppers material of over 20 years. By the late 2000s, Ari was beginning to suffer from poor health but still appeared in the re-launched Slits on their 2009 'Trapped Animal' album, the first studio album for the group for almost 30 years. Sadly, she died of complications from her ongoing illness on 20 October 2010. The first voice ever to be heard on an On-U Sound record had faded away aged only 48.